On May 12th Sylvia Joinson gave us a most interesting talk on the life of Elizabeth of Bohemia, 1599 – 1662. She was the Daughter of James VI of Scotland (who later became James I of England), and Anne of Denmark. She was born in Dunfermline Palace and baptised in Holyrood House in Edinburgh, since she was close to the Scottish line of succession. She had one elder brother, Henry, who was expected eventually to succeed to the Scottish throne. Elizabeth was brought up in her early life in Linlithgow by Lord Livingstone and his wife. In 1603, Queen Elizabeth of England died, and since she had no heir, James VI succeeded her, becoming James I of England and VI of Scotland. Elizabeth grew up in the care of Lord Harington and his wife, who lived in Coombe Abbey near Coventry. She developed the usual attainments for a young lady – she spoke several languages, was very musical, and was a good horse rider. At the age of 9, she became caught up with the Gunpowder Plot. The Conspirators planned to proclaim her Queen and bring her up as a Catholic. But this came to nothing after the plot was discovered.. Henry and Elizabeth were now brought down to live in London, and In 1610 Henry was invested as Prince of Wales. Attention soon turned to the question of Elizabeth’s marriage. Various possibilities were considered, but in the end it was decided to marry her to Frederick V, Count Palatine of the Rhine, who was a Protestant, and the same age as Elizabeth. The marriage was arranged for February 1613, but unfortunately her brother Henry died only a couple of months beforehand. Nevertheless, the marriage went ahead, with lavish celebrations, and the couple set sail from Margate to Flushing, and then to Frederick’s home in Heidelberg. Unfortunately Elizabeth was not popular among the population of the Palatinate. She never managed to learn German, and her manners were disapproved of. In 1619, Frederick was offered the throne of Bohemia, whose capital was Prague. He accepted the offer, even though he was a Protestant, and Bohemia was officially Catholic. They were crowned in 1619 in Prague, but a year later were defeated by a Catholic revolt, and they were forced to leave the Kingdom. They lived for a while near Berlin, then were invited by the Prince of Orange to live in exile in the Hague, in what is now the Netherlands. 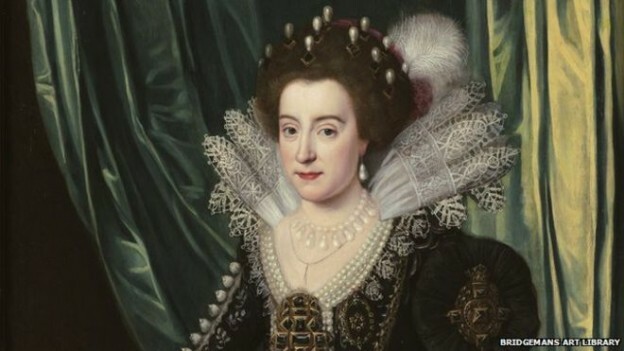 At the age of 36 Elizabeth was left a widow with 10 children when Frederick died of a fever. At the Restoration she returned to England, her son Rupert having fought in the Civil War. She found a great friend and supporter in Lord Craven who is said to have built Ashdown House on the Berkshire Downs for her. She died in London in 1662, and was buried in Westminster Abbey, close to her elder brother, Henry Prince of Wales. Her hopes that her daughter Sophia might marry Charles II were disappointed, but Sophia was later married to the Elector of Hanover, and it was Sophia’s son George who was invited to succeed Queen Anne as King George I, and who thus began the dynasty that still exists today. This entry was posted in General interest, Talks on May 14, 2016 by Bob Goodenough.